Within a few months, the Magna Expo Mueblera will open its doors at the Banamex Exhibition Center with its two large international specialized exhibitions: the Magna Expo Mueblera Industrial and the Magna Expo Mobiliario e Interiores. 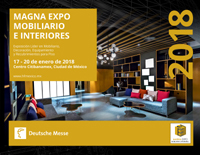 From January 17 to 20, 2018 the Magna Expo Mueblera Industrial will present machinery, tools, equipment and solutions to work and transform the wood while the Magna Expo Furniture and Interiors will have to do with furniture, decoration, equipment for the home and coating for floors. The organizers, the Deutsche Messe AG, Hannover, represented by its Mexican subsidiary Hannover Fairs Mexico, account for a high participation of international exhibitors. 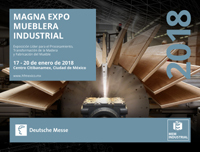 “In particular we are pleased by the large participation in the German official collective stand at the Magna Expo Mueblera Industrial, promoted by the Federal Ministry of Economy and Energy,” says Mr. Christian Pfeiffer, Global Director LIGNA and Woodworking Events of the Deutsche Messe AG, Hannover . It will present products and solutions from companies such as Baumer Inspection GmbH, Dieffenbacher GmbH, as well as machinery and equipment from the Shanghai Wood-Based Panel Machinery Co., Ltd., Fagus-GreCon GmbH & Co. KG, Hans Weber Maschinenfabrik GmbH, Heinrich Kuper GmbH & Co. KG, Kuratorium für Waldarbeit und Forsttechnik eV (KWF Board for Forestry Works and Technology, A.C.), Pallmann Maschienenfabrik GmbH & Co. KG, Siempelkamp Maschinen- und Anlagenbau GmbH, TIGRA GmbH as well as Venjakob Maschinenbau GmbH & Co. KG. Numerous leading companies in their respective market segments, such as Altendorf GmbH, Leitz GmbH & Co. KG, SCM Group, Stiles Machinery Inc. or Michael Weinig AG / Holzher, represented by their distributor in Mexico, have already registered and will be with own stands. “At the fair, once again, numerous machines will be shown in operation, both from local exhibitors and from big players,” says Pfeiffer. “The Magna Expo Industrial Furniture next year will be more international than ever,” adds Pfeiffer. “In addition, the conference program offered in parallel, which will address issues such as the use of CNC machines, intelligent manufacturing or trends and design in the furniture industry, already awakens a high degree of attention.” Pfeiffer concluded. In the previous fair there were 217 exhibitors from Mexico, Brazil, Colombia, France, Germany, Hong Kong, Turkey and the United States. On a gross exhibition area of approximately 30,000 square meters. With the LIGNA, world trade fair for machines, equipment and tools for wood working and processing, and DOMOTEX in Hannover, the world’s largest trade fair for floor coverings and carpets, the Deutsche Messe AG has a network of global reach and excellent contacts.